Henry Carter was born in England and learned the engraver’s trade while working for the Illustrated London News. He came to New York City in 1848 and, in 1855, under the pseudonym “Frank Leslie,” began publishing Frank Leslie’s Illustrated Newspaper, which featured superbly engraved illustrations and became the most popular and influential weekly in the nation. He introduced the technique of dividing drawings into modular blocks that could be given to several engravers, then reassembled for reproduction. This greatly speeded the work and enabled the illustration of fast-breaking news events. 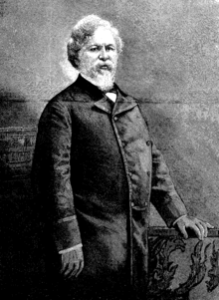 He made his fortune providing illustrated coverage of the Civil War.